Showbox APK Download for Android and enjoy tons of movies and TV shows online. You can even download the movies to your device. Showbox APK for Android. Most of the online streaming Apps do not store the movies on their web servers but search the web directory to stream the movies and TV shows online. Below is the direct download link to ShowBox HD APK for Android. Note: Make sure you have enabled unknown sources on your device. Showbox app doesn’t require you to have a login account. There are no annoying Ads. Support HD quality and also allows all other resolution viewing. How to Download and Install ShowBox App? 2. Download the ShowBox from Google. 4. Open the App, make all the necessary settings if prompted on the screen. Showbox app has an extensive library of movies, TV shows and music which are updated regularly. As you can expect the app is not available on Google play store, given the Google’s Policies & Conditions. But many times the app shows up in the Play Store so it is better to search for the app. But if you wish you can download the apk file for your Android smartphone. With ShowBox HD you can stream TV Shows & Movies, set resolution for stream or download them directly onto your device storage for offline viewing. Will ShowBox Ever Shut Down? Yes! But not completely. If someone files a lawsuit than of course the Showbox TV will lose the battle very plain. Google and other search engines may be forced to remove the Content from its results. Even the government may impose the restriction on the Sites. The legality of the ShowBox HD App depends on your country and also on the material being presented. The App streams movies and TV Shows from Torrents and other sources not accepted by studios. Downloading or streaming copyrighted material that you don’t own without permission or paying for it is illegal. There are Many alternatives which you can try to gain access to a large amount of media library. You are downloading the file at your discretion and we are not affiliated with the App or its content in any form. In many countries, there is no regulation on Mobile Streaming. Check your local jurisdictions for more detail. Said that the App has a lot of programming with copyright infringement under its hood, you may be under the scanner by your government for streaming the content which is not bided by the law. But looking at the nature of the App, there may be very few who could resist themselves from the ShowBox. You can stream safely by using a VPN service. There are a number of VPN Apps and services covering all types of devices. What is the Official Website of ShowBox? ShowBox use to have an official web page, but soon it disappeared. Basically to keep the anonymity. The developer ‘Andrew Crow'(may be pseudoname) work in dark to release new versions in form of updates. Presently a number of 3rd party websites offer the download links to the App. These websites do not have any relation to App in any form. They just try to gain the popularity of the App to make profits by Advertising on their site. As of now, no any official website is available for TerrariumTV but a nearly official subreddit page works, you can visit there for more information. This is the 2nd most asked question, there are a number of Apps which work like the SBox App. Going by some legal entities Pluto TV, Snagfilms, Viewster etc are similar to Showbox but unlike Box, it is completely legitimate. Though the App may not have a comparable video library, it offers content for free (albeit Ads). The Pluto TV offers interface in “Netflix Fashion”. You may not find all the wealth of ShowBox on Pluto but it is simple, legal and free. The App is generally developed for Android-based devices. You can download and install it directly on your Android running device like Smartphone, Android TV or Box, Fire TV Console and other Android-powered digital systems. But to run it on any other system like Windows or Mac you need a good emulator. ShowBox is available freely on the net with 100’s of sites hosting the file. But you need to be safe because there can be spoofs which go by the same name and inject malware into the device. The App cannot be in Google Store due to ToS violation. It is better to download the App from reliable sources. As any rogue may cause serious data and privacy issues. How to Download ShowBox on PC? Open the file and follow the simple instructions displayed to install the Emulator. Download the ShowBox App on your Computer. Now on the Bluestacks, you will see the option, “Install APK”. Locate your file and install the ShowBox App. Holla! You can enjoy the free movies and TV Shows on your laptop PC without any hassle. How to Install ShowBox on Fire TV and Firestick? Step 1. Go to Settings. Step 2. Under settings select the option Device and then to Developer Options. Step 3. In Developer options Turn On the Apps from Unknown Sources. Step 4. Now go back to home screen, open search option and search for Downloader. Step 8. Install the Showbox App on your Fire Console. Done! Clear App defaults in Android App settings. To do so, go to, Settings → Apps/Manage Apps → Open Showbox → Default → Clear Defaults. Play the content by selecting the desired quality and click on “Watch Now”. When prompted “Open with”, select your player and set it as always or single time play. What if the App is Not Working or Showing Errors? Clear the data and cache or update the Showbox App. Using an older version of the App will help eliminate any compatible issues. There is no any potential fix for the issues, all you can do is try a VPN service which will create a proxy server in other countries where the link or server may not be restricted. You can also check for other server links if available. You can even clear the data and cache or even update the Showbox App. For Android Lollipop and above users, you can try this potential method, Go to Setting>About phone, tap 7 times on Build version to unlock developers option in setting. Scroll down in developers option until you see entry under media called Use AwesomePlayer (deprecated) and enable it. If it previously enabled disable it, reboot your device to check for the fix. Open Apps or Apps manager. Using an older version of the App will help eliminate any compatible issues. The older version of the App will run using prior dynamics which are comfortable with phone specs. You can Google search to find an older version of the App for Android OS. You can also tweak the App codes using APK Editor App and then try running the App. Go Settings → Applications → Manage Installed Applications from the Fire TV menu. Select the ShowBox TV App from the list. Clear the cache and/or data, which often resolves intermittent performance issues. Change available settings for the app. For Amazon Fire TV (1st and 2nd Generation) devices, you have an option to move the app between internal and external storage. Go to Settings → Applications → Manage Applications (Look for the App) → Grant all the Permissions. If the video is inaudible than try the following to fix the issue. You can also Turn OFF the Dolby Digital Plus. Just go to Settings → Display & Sounds → Audio from the Fire TV menu. If you’re using an HDMI cable to connect your Fire TV device to your TV, unplug it and then reconnect or may need to try a different HDMI cable. To use the apps anonymously then you can try any VPN services like OperaVPN which is available on the Google Play Store. If any of the streams show any error or issues while loading then also you can try any proxy servers like VPN to stream the content. Keep the RAM space and device storage (Up to 300MB) free for smooth running of the App. 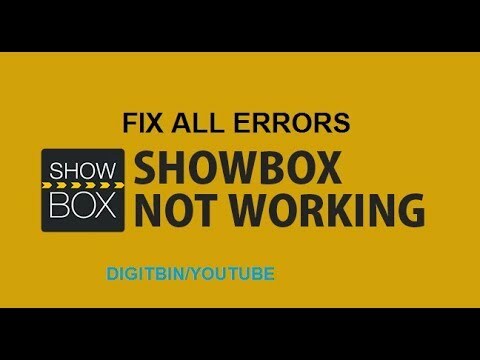 How to Fix All Errors and Bugs on ShowBox App? I do not own the App nor I am affiliated with the App in any form. I have only shared the links to download the file. It may be unsafe to stream content illegally. Proceed at your own discretion. Note & Conclusion: With the Showbox App you can watch Movies on your Android device. The App hosts a large number of Hollywood Movies which can be downloaded or viewed online. I do not own the App, for any copyright issues contact the developer. I hope the post was helpful. Do comment below for any assistance or support if needed. Also, let me know if you are facing any issues with the download link. If you've any thoughts on Showbox App For Android | Legality and Privacy, then feel free to drop in below comment box. So i updated showbox and ever since that day i havent been able able to watch any tv shows it just says to try another time wat should i do ??? Terrarium tv is no more . So please remove it ! Hi I’ve been watching show box regularly now without any issues for a couple of months but directly I updated the app all it does is say it’s loading once it’s turnt on. I’ve tried delecting data and cache then reboting but still it doesn’t play. I hope u can help this non computer savvy – lover of films and shows out. U wud truly put back a happy face on me. Thanx 4ur time.